The fields of glycochemistry and glycoscience are rich and varied and where much can be learned from Nature. As Nature is not always able to produce carbohydrates in quantities useful for not only in research but also as therapeutic agents, new ways need to be found to optimize the yield. 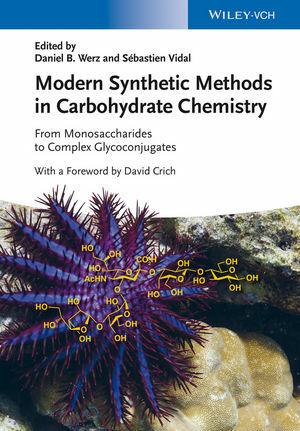 This book presents an overview of the latest developments in the field of carbohydrates, ranging from de-novo approaches via cyclodextrin chemistry to the synthesis of such highly complex glycoconjugates as glycosphingolipids and GPI anchors. The main emphasis remains on the synthetic aspects making the book an excellent source of information for those already involved in carbohydrate chemistry, as well as for those organic chemists who are beginners in this field. Equally of interest to synthetic chemists, as well as medicinal chemists and biochemists. Daniel B. Werz is Professor at the Technical University of Braunschweig, Germany. Having obtained his diploma (2000) as well as his Ph.D. (2003) from University of Heidelberg he spent over two years of postdoctoral research with Peter H. Seeberger at ETH Zurich, Switzerland, before starting his independent career at the University of Göttingen, Germany. In spring 2013 he took up his present position as an associate professor in Braunschweig. Prof. Werz has authored and co-authored over 100 scientific publications and has received several scientific fellowships and awards, including the Ruprecht Karls Award of the University of Heidelberg (2004), a Feodor Lynen Fellowship of the Alexander von Humboldt Foundation (2004), the Klaus Grohe Award of the German Chemical Society (2006), the Emmy Noether Fellowship of the German Research Foundation (2007), the GlycoThera Award (2010) and the highly prestigious Dozentenstipendium of the Chemical Industry Fund (2011). Sébastien Vidal is Chargé de Recherche at Centre National de la Recherche Scientifique (CNRS) and is responsible of a small research team at ICBMS (Université Claude Bernard Lyon 1, France). In 2000, he has obtained his PhD in organic chemistry from Université Montpellier II (France) working on mannose 6-phosphate analogues. He then continued as a postdoctoral fellow in the group of J. Fraser Stoddart at University of California, Los Angeles for three years to design synthetic methodologies for the preparation of glycodendrimers. After another postdoctoral position at the National Renewable Energy Laboratory (NREL, Golden, Colorado, USA) under the guidance of Joseph J. Bozell, he then moved back to France and was appointed as a CNRS fellow in 2004. Dr. Vidal has co-authored over 60 scientific publications devoted to organic and carbohydrate chemistry.